Ever fished on a driveway? Neither have I, but on Saturday morning, my dad, Roderick Spilman, an amazing fly fisher, taught me how to fly fish. He helped me with my wrist movements and showed me how to arrange my rod in just the right position to catch a fish. When I was basically perfect at casting, we took off to the LA River. When we arrived, we got started immediately. We caught a few fish (Tilapia and Bass) at the first spot but not enough for us to be satisfied. We decided to move downriver where my dad’s friend, Roland Trevino, was. I wasn’t exactly eager to go into the rapids, but I did anyway. It felt good to get my feet wet and cool in the refreshing water. My dad cast a few times in the pool of water directly in front of us. Almost instantly a fish tugged on his line. My dad brought it in telling me to always maintain pressure on the line. I was as startled as he was when he brought in a bluegill. We had never seen a bluegill at the LA River before. I used my Practicaster and cast in the same direction as my dad. I stripped the line with short yanks. I felt a tug and I felt the fish pulling on the line. I was surprised to get a tug so soon, and I pulled in the line like crazy. When it was finally in, we noticed that it was a bass. It was smooth and not as wide as a bluegill. It was shaped like a long bullet. My dad was happy that I had finally caught a bass. After all, I had never caught one before. After that, we took turns. Every time someone caught one, we would switch the two weight and Practicaster back and forth. After passing the rod back and forth multiple times, we decided we would try another part of the water. We moved up into the calmer water where Roland Trevino was. He moved aside and we slid into his spot. We didn’t have too much luck there, and we only a caught a few tilapias and another bluegill, so we moved back into our old spot. It was already evening, and we decided we would leave after a few more casts. A few turned out to be quite a bit. We kept fishing and passing the rods. It felt as if the water was not as strong, but I knew that I was just getting used to the current. The activity seemed to die down, until I felt a strong yank on the line. I was a little bit anxious that I would lose this next fish, so I made sure I was calm while I brought it in. My dad grabbed the line when the fish was close enough and grinned. I turned to look at the fish, and, in his hands, I saw the biggest tilapia I had caught. He handed it to me and I unhooked it and felt its long smooth scales. It was so beautiful I felt like I was dreaming. I loved its red tipped fins. It looked as if its fins had been dipped in a vibrant vermillion color. I held it out for a picture, full of pride. I released it and looked at my dad, thankful that he had taught me how to fly fish. While we drove home, I counted all of the fish we had caught which added up to be a whopping 34 fish. I don’t think I will ever forget that day when my dad and I pulled in so many fish. 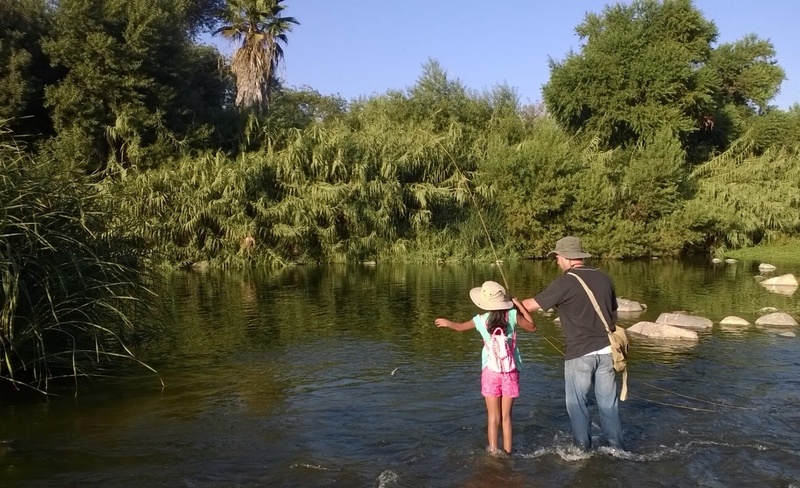 Editor’s note: The following weekend, Roland Trevino, who took the accompanying photos, and his son, Ansel, caught 32. This is a great fall for fly fishing. ← Drum roll, please … yes, we have a winner! Thanks, Roland, for those nice pictures of us. I think I will keep that one of Julia and I in the river as a favorite for a long time to come. Ah, so the credit goes to Roland? Yes, I rarely take my camera out, because there is no doubt whatsoever that I would drop it in the river.